There was pandemonium just after 10pm yesterday as a man called CNN to say five bombs had been placed throughout the facility inside the Time Warner building at Columbus Circle. According to CNN.com, several fire alarm bells rang inside the building, signaling an evacuation after the call was received shortly before 10 p.m., the company's security said. Staffers evacuated the CNN New York offices in the Time Warner Center building and Don Lemon's "CNN Tonight," which had been on a commercial break, was taken off the air. The network temporarily went to taped programming for about half hour before going live from the street while police investigated. "We were told to evacuate the building and to do it as soon as possible. We grabbed what we could and got out of the building and now, we are standing outside of the building," Lemon said. "All of the employees, all the people who were in the building as we were doing our live broadcast are out of the Time Warner Center now," he added. 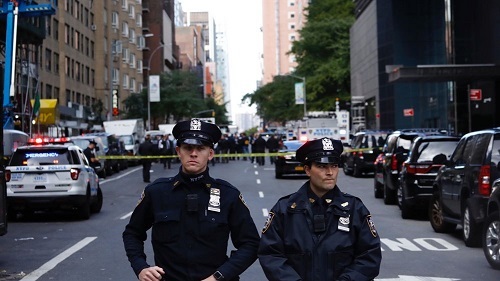 Numerous police and fire department trucks blocked all vehicle and pedestrian traffic on West 58th Street between 8th and 9th Avenue due to a police investigation at Columbus Circle, where the Time Warner Center is located, the New York Police Department tweeted. A bomb squad was on standby outside the building as police officers search the offices, a law enforcement source said. The network's bureau was evacuated in October after a package with an explosive device, addressed to former CIA Director John Brennan, was discovered, officials said. That package was among more than a dozen improvised explosive devices sent to prominent Democratic politicians and donors around the country in October. None of the devices detonated, and no one was injured. Suspect Cesar Sayoc, 56, was charged with five federal crimes and is currently in custody waiting for trail. If convicted, he could receive up to 48 years in prison. Meanwhile, Police and CNN have issued an all-clear message after the network's New York offices and studios were evacuated Thursday night because of a phoned-in bomb threat. "The NYPD has now given us the all clear, and employees have been permitted to return to the building," CNN Worldwide president Jeff Zucker said in an internal memo to staff. "The building is secure and safe for everyone to return in the morning." "We appreciate the swift action by the local authorities, and the patience and professionalism of all the employees who were impacted."